December 04, 2008 by Alphageek in "alphageek bourbon virginia tech wild turkey uva 2008"
This is an easy one to write. 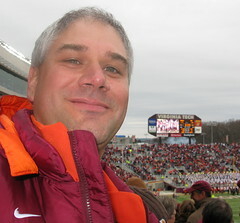 Last Saturday, we attended the Virginia Tech-uva football game. It was a cool afternoon. The wahoos played hard, but Virginia Tech came away with the win. uva lost a chance to go to a bowl game and their coach was the ACC coach of the year last year. I can't remember the last time anything other than pride was on the line when we lost to uva in football. The picture is of me feeling very smug after the game. I wished a couple of wahoos luck at their bowl game, but they did not think I was funny. The wahoos were very subdued after the game. They have two chants they like to use, that I call chant #1 and chant #2. One year, I got both chants from the same guy, but usually I hear the chants from different wahoos. Cahnt #2: "#1 at _________ (fill in the blank). We swept the wahoos in men's bball last year, so #1 would have been funny. I think I heard a wahoo say "wait until that sport with the nets on the sticks comes, we will get those Hokies then." About all I could find was a guy carrying a sign that looked like a six year old made it. He was quite proud of his sign and carried it out to the parking lot. Take a look at his sign here. I respected his effort so much, I had a Wild Turkey in his honor after the game. "alphageek bourbon virginia tech wild turkey uva 2008"